a granular, vitreous, porous form of silicon dioxide made synthetically from sodium silicate. Silica gel is tough and hard; it is more solid than common household gels like gelatin or agar. 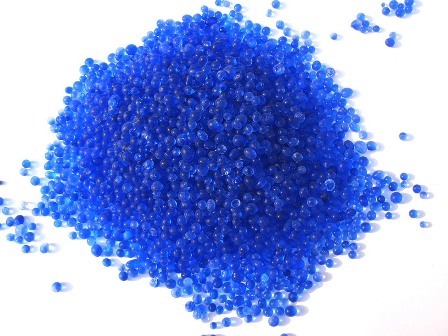 It is a naturally occurring mineral that is purified and processed into either granular or beaded form. As a desiccant, it has an average pore size of 2.4 nanometers and has a strong affinity for water molecules. Application: it is used as a desiccant to control local humidity to avoid spoilage or degradation of some goods. Silica gel's high surface area (around 800 m2/g) allows it to adsorb water readily, making it useful as a desiccant (drying agent). Silica gel is often described as "absorbing" moisture, which may be appropriate when the gel's microscopic structure is ignored, as in silica gel packs or other products. However, as material silica gel removes moisture by adsorption onto the surface of its numerous pores rather than by absorption into the bulk of the gel.